Voice SEO and CX personalization are growing significantly and becoming increasingly important for customer experience professionals, according to analysts reflecting on the short- and long-term future of the field. 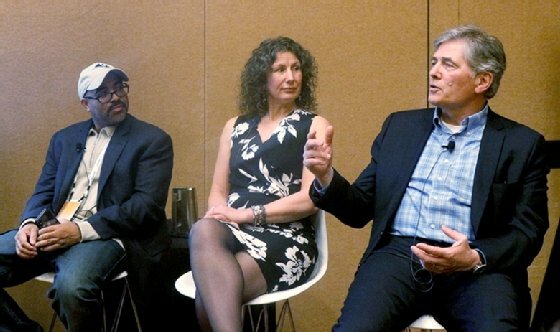 In a session at Oracle’s Modern Customer Experience conference, analysts Brent Leary of CRM Essentials; Denis Pombriant of Beagle Research Group; and Ginger Conlon, U.S. editor of The Drum, discussed the effect of these trends on customer-brand relationships. Voice SEO and CX personalization are coming into clearer focus in the CX space, and they have implications for marketing, sales and service professionals who want to ensure customer success. There are many potential use cases for voice channels. Voice SEO with smart speakers and voice chatbots have drastically changed the way that people search for information, shop online, and interact with apps and IoT devices. This means that marketers need to rethink the ways they attempt to reach customers. From left, analysts Brent Leary, Ginger Conlon and Denis Pombriant discuss the future of customer experience at Oracle’s Modern Customer Experience conference. Voice has huge potential to ease processes for marketers, salespeople and service agents, the analysts said. Leary predicted that voice will be a powerful technology for productivity, not only for consumers who want to make quick purchasing decisions, but also for salespeople. CX professionals can then turn customer insights from that higher quality data into better interactions with customers and, ultimately, a better customer experience, Leary said. Brands work constantly to know as much about their customers as possible, but there is a point where customers become uneasy when confronted with, for example, a targeted ad that revels just how much a company actually knows about them. Recent data privacy regulations, including GDPR and the California Consumer Privacy Act, reflect customers’ desire for autonomy. But analysts agree that customers also want personalized experiences that will help them solve problems faster. The challenge to marketers, then, is finding out which customers appreciate hyper-personalized content and which customers it will drive away. To prevent this dilemma from turning into a single CX strategy for each customer, Conlon recommends that CX professionals hone in on customer lifetime value as a way of creating meaningful, profitable relationships with the right customers. Any one trend, be it voice SEO, CX personalization, augmented reality or virtual reality, will only be the big thing in CX until the next big thing comes along. Pombriant predicted that one of the most important capabilities of the near future will be what he called a CRM emotional quotient, or EQ. Agents and chatbots could use these recommendations to hone their scripts for interacting with customers. A marketing automation platform could use EQ data to pitch the best deals to a customer at a time when they have a higher probability of accepting it. No vendors have stated that they are working on this technology yet, but change can happen fast, Pombriant said. “All of the basic technology to do this is already available, and, therefore, what we really are talking about is process, permissions and procedures — all things you don’t need to code, which means that the innovation could happen rather quickly,” he said.